Vegan Roadshow is gearing up to be an exciting journey around the UK for a merry band of travellers. 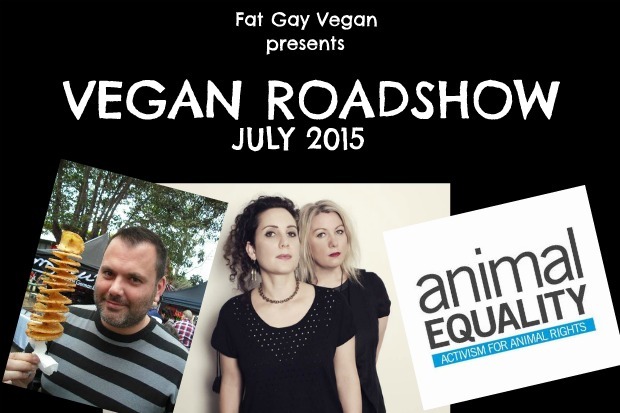 This July, I am hitting the road with Australian vegan band Love Like Hate and activist group Animal Equality for a series of events around the country. We have dates scheduled in London, Leeds, Newcastle, Glasgow and Oxford, plus we are adding new dates over the coming weeks. Like this one in Nottingham! I am thrilled to be teaming up with legendary vegan trailblazers Veggies Catering Campaigns for the July 21, 2015 stop of the tour at the Sumac Centre. Veggies are pioneers in the UK. They have spent decades educating people on vegan issues through compassionate catering. You will be hard pushed to find a more ethical undertaking than this food, activist and education enterprise. Read about all the levels of their awesomeness here. So what is going to happen at the Nottingham stop of the tour? Love Like Hate will be performing a special semi-acoustic live show, Veggies will be selling their tasty vegan treats, Animal Equality will be spreading news of their outreach work and selling merchandise while I will be chatting to anyone who will listen. The Nottingham stop of Vegan Roadshow is a powerhouse collaboration between some of the busiest names in vegan UK. Support independent vegan musicians. Support vegan caterers. Learn and share information. Be there! Click here to donate via the Vegan Roadshow Indiegogo campaign and claim your Nottingham ticket.